VHP is excited to be a part of the development of this vocational school located in Duchity. The first adult classes began in fall 2014! Learn more about this exciting project! 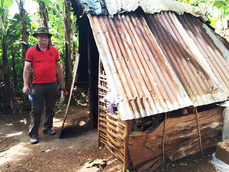 Working alongside Haitian professionals in this field, we purchase water filters for home installations. 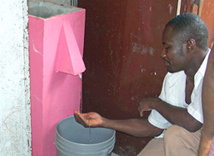 Learn more about our work with BioSand water filters! Learn more about this center, which provides education, mentoring, and basic care needs to children who previously had no opportunities to go to school. In 2008 VHP opened and operated a full time medical clinic in Desab - a beautiful mountain community, helping to create a fully staffed and regularly scheduled clinic where there was once no access to health care. In keeping with the VHP model of developing self-sustaining programs, we are pleased that, in 2012, another U.S.-based organization took over management of the clinic, which continues to grow and perform a great service. There is no shortage of needs in Haiti, in particular, the need to be self sustaining and hopeful. 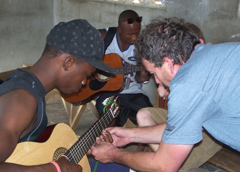 We are happy and proud to provide material assistance to our friends in Haiti. Clothing, electronics and sports equipment- so ubiquitous in the United States- is coveted in Haiti. However, as the programs above reveal, our primary goal is to establish methods whereby Haitian citizens can provide for themselves. More than a handout, they need opportunity. For more information regarding our programs, please CONTACT us.